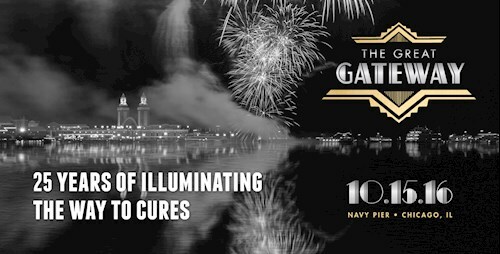 Gateway for Cancer Research, a non-profit dedicated to funding transformational cancer research, raised $4.1 million at its 25th annual Cures Gala, “The Great Gateway: 25 Years of Illuminating the Way to Cures,” on Saturday, October 15 in the Aon Grand Ballroom at Navy Pier in Chicago. Gala co-chairs were Richard J Stephenson, the founder of Gateway for Cancer Research and Cancer Treatment Centers of America® (CTCA), and his wife Dr. Stacie J. Stephenson, CTCA Chairman, Functional Medicine. Guests enjoyed an evening of star-studded entertainment including performances by 16-time Grammy-winner® David Foster, 5-time Grammy-winner CeeLo Green, multi-platinum Grammy nominated singer and songwriter Carly Rae Jepsen, Grammy-winning artist Michael Bolton, stand-up comedian Sinbad, platinum-selling artists The Tenors and Rock and Roll Hall of Fame Inductee Peter Cetera. Gateway founder, Richard J Stephenson, a recognized philanthropic pioneer whose personal passion following the loss of his mother, Mary, to bladder cancer has changed the face of cancer care, received Gateway’s Impact Award for his contribution and tireless dedication to the Gateway mission. Since Gateway for Cancer Research was founded 25 years ago, more than 3,000 patient lives in 140+ Gateway-funded clinical trials at institutions worldwide have been directly impacted, and countless more cancer patients have benefited as a result of this critically important work. The gala showcased many of Gateway’s 57 patient trials currently underway, including a brain cancer trial led by Dr. Sarah Leary from Seattle Children’s Hospital. Dr. Leary is conducting research with children undergoing brain surgery utilizing “Tumor Paint,” which acts like a molecular flashlight for surgeons. This revolutionary drug is given the day before surgery and attaches to tumor tissue and glows under fluorescent light, so doctors can pinpoint the cancerous cells during surgery. One of the evening’s most moving moments was the appearance of the Coffman family, whose two-year-old son, Hunter, is a thriving and healthy toddler only a few short months after his Tumor Paint-supported brain surgery with Dr. Leary. Hunter’s mom, Laura, expressed her heartfelt gratitude to Gateway for making Dr. Leary’s Tumor Paint trial possible, recognizing that far too many children have very different outcomes from similar brain surgery without the benefit of Dr. Leary’s innovative molecular flashlight. Proceeds from the event specifically support Phase I and Phase II patient trials across cancer types, including breast, blood, lung and brain cancers. Guests entered a Roaring 20’s setting and enjoyed a custom “Gatsby inspired” menu, designed by renowned Chef Markus Ford. A silent auction and live paddle raise bidding gave attendees the opportunity to donate at the level of their choice to continue the quest for a cure. Individual tickets to the event were $1,000, and guests also had the opportunity to select higher level sponsorships with deluxe VIP packages. Gateway for Cancer Research proudly acknowledges its premier sponsors: Capricorn Investment Group, LLC; Madha & Rajesh Garg; Andi & Jim Gordon/The Edgewater Funds; Bill and Annie Stephenson Hostelter; Katten Muchin Rosenman LLP; Kayne Anderson Real Estate Advisors; Darren & Jennie Keller; Robert & Cynthia Mayo Family Foundation; McGuireWoods; N-Jet; Rising Tide Foundation, Riverside; Satter Foundation; Stellar Insurance, LTD; Shawn and Morgan Stephenson; Talent Plus; The Richard Templer Family; and the Thurston Family Foundation. Gateway for Cancer Research is a nonprofit 501(c)(3) organization committed to funding innovative cancer research that helps people with cancer to feel better, live longer and conquer cancer TODAY! Thanks to generous underwriting, 99 cents of every dollar Gateway receives directly funds Phase I and Phase II cancer clinical trials at leading research institutions across the country and abroad. Since 1991, Gateway has supported more than 140 clinical trials and funded millions in breakthrough research. Get involved today by visiting www.GatewayCR.org, like us on Facebook at facebook.com/demandcures and join the conversation on Twitter @DemandCures, #BeAGateway.